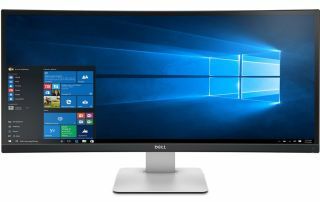 Amazon is home to a pretty good bargain for Dell's UltraSharp U3415W ultrawide monitor with a 34-inch curved display. It's currently marked down to $600, or half off its normal selling price, according to Amazon. The savings aren't quite that significant. While once a pricey monitor that topped $1,000, Dell has it on sale for $800 on its website, while Newegg has it for $815 and B&H Photo for $721. Still, Amazon's discount is the deepest around from a reputable vendor. Dell's U3415W uses an In-Plane Switching (IPS) panel with a 3440x1440 resolution at 60Hz. Other vitals include a 5ms (fast mode) to 8ms (normal mode) response time, 300 nits brightness, 2,000,000:1 dynamic contrast ratio (1,000:1 typical), and 99 percent coverage of the sRGB color space. The monitor has a built-in USB 3.0 hub with two upstream ports and four downstream ports. It also features built-in speakers and a stand that supports height, tilt, and swivel adjustments. There are connectors aplenty here, including HDMI 1.4 with MHL, HDMI 2.0, mini DisplayPort, DisplayPort 1.2, and DisplayPort out (MST). You can grab the Dell UltraSharp U3415W on sale here.